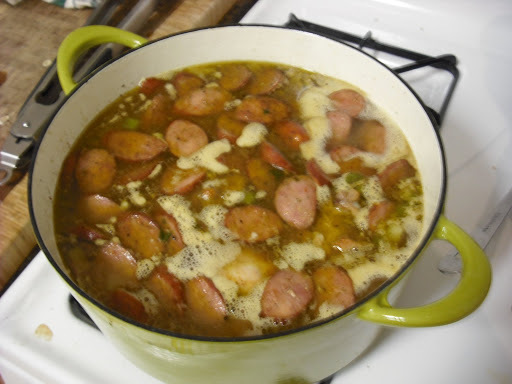 This recipe comes from Duke, BJ’s cousin, who went to LSU and lived in Louisianna for a few years. In other words, this is the real deal people. I suggest making it on a Sunday when you have some time to stand at the stove and fully enjoy cooking a BIG dinner. We had a few friends over, beers, and listened to a few live Phish shows. A perfect afternoon, I must admit. As you will find out, we don’t cook without garlic. I know, so cliche, but I really think that my garlic consumption is becoming an issue. If I eat something without garlic, it lacks taste for me. 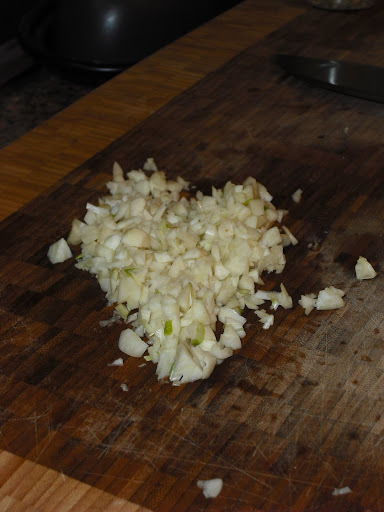 If I’m cooking and a dish is missing a little something: garlic. I buy garlic 5 at a time and go through a head in a week’s time. I think I could be the poster child for garlic sales…wait…could there be a GA (garlic’s anonymous) group out there somewhere?!? I bring this up because I recently read an article about how American food is over-garlicked. And I wonder if this is effecting/ruining my palette. I think I need to detox. 1. Heat 3 QT Dutch and EVOO to medium-high. 2. Season chicken with S & P, cayenne, and EVOO. Add to hot oven and deeply brown all over (this takes a good 10 – 15 minutes). Remove and set aside. 3. Add sausage and brown for about 5 minutes. 4. Add onion, pepper, celery, jalepeno and cook down for 5 to 10 minutes. Add garlic and other seasonings, cook for 2 minutes. 5. Add chicken back to oven and cover with 3 to 4 QT of chicken stock. Simmer for about an hour or until the meat falls off the bone. 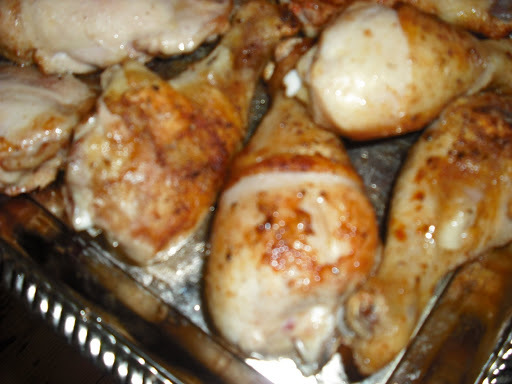 Remove chicken and debone. Add chicken and sausage back to the pot. 6. Add rice. Turn heat up to medium high and stir rice constantly until it comes to a boil (about 5 minutes). 7. Cover pot and turn to low, simmer for 25 minutes. DO NOT PEAK! 8. Add shrimp for the last 5 minutes. Just toss shrimp on top of the jambalaya and they will steam. 9. After 25 minutes, turn rice over and distribute meat evenly. 10. Garnish with green onions and serve! This entry was posted in chicken by callywoodfarms. Bookmark the permalink.